This is one of Janet Jackson's more memorable tunes, mainly because the chorus reflects the title of the song so strongly. The lyrics are about a bad relationship with a man who doesn't do anything for her - pretty obvious, really! The track was the lead single from Janet's third studio album Control, and reached #4 in the U.S. and #3 in the UK. Not wanting to be outdone by her brother, Michael, Janet also released nearly every track on the album as a single. These were; Nasty, When I Think Of You, Control, Let's Wait Awhile, The Pleasure Principle and Funny How Time Flies (When You're Having Fun) - the last rack wasn't released in America. Reviews of the song were very favourable, with many critics liking the fact that Jackson was portraying the image of a strong, independent woman. 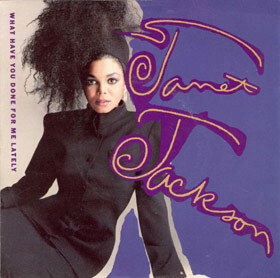 More importantly, the record-buying public also liked it, and this became Janet Jackson's first Top 40 single in many countries.